The aggregate performance numbers and evidence suggesting that most investors are holding inappropriate asset allocations foretell disaster for the investors who are relying on their 401(k) plans as the primary source of their retirement income. There is little question that the average investor would benefit from some help in portfolio construction and maintenance. 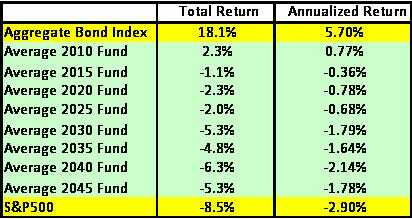 One need look no further than the annual DALBAR QDIA studies to see that the average investor in equity funds has generated annualized returns of around 3% a year over a 20-year period in which the S&P500 has returned 8.2% per year and the Barclays Aggregate Bond Index has return 7% per year. Why are individual investors getting such poor results? Bad fund selection and timing may be costing individual investors as much as 3.7% in annual return. There is also the problem of high fund expenses. From 1983 through 2003, the average equity mutual fund lagged the S&P500 by almost 3% per year. These two factors alone are sufficient to reduce the average equity fund investor’s return down to the observed 2-3% per year. Even if investors were investing in low-cost index funds, how would they figure out how much risk they should be taking on? We know that a large fraction of investors have portfolios that are extremely out-of-sync with basic standards in terms of the balance between risk and return. In a survey of 2.8 Million 401(k) plan participants, Financial Engines found that 66% of individuals had portfolios which were either at an inappropriate risk level or improperly diversified. Target Date funds are designed to provide a solution to many of these problems. The basic idea behind Target Date (TD) strategies is that it should be possible to create a one-stop well-diversified fund that is keyed to an expected retirement date. All an investor has to do is choose the fund which is intended for his age cohort. If you are going to retire in 2030, you buy a 2030 fund. This solution has proven a popular one, and Target Date funds have quickly grown to $340 billion in assets. Target Date funds change their asset allocations as the target retirement year approaches, reflecting the idea that investment risk tolerance tends to decline as investors age. Target Date funds are designed based on a targeted allocation to stocks, bonds, and (in some cases) REITs and commodities. The Target Date allocations specify the mix of bonds between short- and long-term, and between corporate vs. government bonds. They also deal with questions like: How much weight should be given to emerging market stocks vs. domestic stocks? Large cap vs. small cap? The last several years have acted as something of a crucible for testing the design of the Target Date offerings. In the aftermath of this financial crisis, we can look at the performance of Target Date funds, gain insight into whether these funds have fulfilled their promise, and also identify areas where improvements could be made. The under-diversification in Target Date Funds resulted in funds for which the returns were so highly correlated to returns from the S&P500 that these funds had almost no protection from a significant decline in U.S. equities. In 2007, I started working with Folio Investing (the sponsor of this blog) to analyse the strategies being applied to develop Target Date Funds, with an eye to whether there was room for improvement. The first step in our research was to determine whether these funds were fully exploiting diversification opportunities. The second step in our research was an independent study of the risk levels in these funds. The third step in our research was to look at expenses. Expenses are always important, but especially so for investments like Target Date funds, designed to be held over very long periods. The primary finding of our research was that Target Date Funds were not fully exploiting the range of investments available to them. Our research, consistent with that from a range of sources, suggested that in general a lack of diversification beyond major stock and bond indexes could cost investors as much as 1%-2% per year in return at risk levels associated with Target Date investments. The under-diversification in Target Date Funds resulted in funds for which the returns were so highly correlated to returns from the S&P500 that these funds had almost no protection from a significant decline in U.S. equities. I wrote a summary article in early 2008 that covers a number of these topics. On the basis of this study, we created an alternative to Target Date funds: Target Date Folios. These are not mutual funds, but are baskets of Exchange Traded Funds (ETFs) that investors can buy, own, and sell as easily as a single security, launched at the end of December of 2007. In the three-year period through 2010, the market has experienced levels of volatility far above those experienced at any time since the advent of self-directed retirement plans. Target Date strategies, not to mention the logic of owning a diversified portfolio over long periods of time, came under scrutiny. As we have emerged (apparently) from this period of upheaval, we can examine the performance of Target Date Funds (and Target Date Folios) to see what lessons we might draw. Looking at the three year period from 2008 through 2010, the S&P500 lost 8.5% of its value, including dividends. The Barclays Aggregate Bond Index gained 18.1% over this three-year period. A portfolio that started half in the bond index and half in the S&P500 at the start of this three year period, would have gained a total of 4.8% over this three year period (assuming no rebalancing). Though many of these funds are in negative territory, the results show that Target Date Funds have done their job on average. Overall, the bond allocations in Target Date Funds have substantially reduced the impact of the sharp decline in equity markets in recent years. The numbers also show that funds aimed at people closer to retirement clearly were more tilted away from equities, as would be expected as a fund gets closer to its target date, and therefore more conservative. This result alone is a substantial validation of the Target Date concept. Unfortunately, the averages mask the fact that the spread in performance across the population of these funds is enormous. Among the 2030 Target Date mutual funds, for example, the three-year cumulative return for the best-performing fund is 2.1% vs. -14.1% for the worst-performing fund. The high degree of variation in performance across fund families means that plan sponsors and individual investors need to look closely at the asset allocations in target date funds and not simply assume that all funds are created equal. So Target Date Funds did ok on average. Did Folio’s more diversified approach pay off? The table below compares the average Target Date Fund performance to our Moderate Target Date Folio, and to a benchmark, the Morningstar Moderate Lifetime Allocation Index*, over the past three years (2008 to 2010). The results above for the Target Date Folios do not include brokerage costs and other costs that investors may face, but these results do include the expense ratios of the underlying ETFs that comprise the Folios. We have also compared the Conservative and Aggressive Folios to the Conservative and Aggressive Lifetime Allocation Indexes, with similar results. Even if we apply an aggressive assumption for brokerage costs and for other costs that might be encountered if these Folios were included with a 401(k), for example, the performance over the past three years holds up. For an extended discussion of these factors, please reference the FolioInvesting white paper. We estimated that a 1% in reduction in annualized return for costs was on the high end of what an investor might encounter due to brokerage costs and costs related to having these funds in a 401(k) offering. The Morningstar Lifetime Allocation Indexes do not include the impacts of any expenses. Obviously three years of performance is far from definitive and all of the standard caveats apply (e.g. past performance does not predict future performance). But it does look as if broader diversification significantly benefited the Folio investors. Better diversification across and within broad asset classes has helped the performance. Given the research into how badly retail investors lag broad indexes of stocks and bonds (e.g. DALBAR’s QAIB), the average investor would probably have done considerably better in Target Date investments than in the alternatives he might otherwise have chosen. Our research from 2007 that suggested that Target Date Funds were under-diversified and that better diversification could substantively improve performance is consistent with the results for the Target Date Folios vs. funds over the past three years. The support for a well-diversified asset allocation made up of low-cost funds has come under considerable scrutiny in recent years. The evidence suggests, however, that most investors would be better off in such an investment. The performance of Target Date Funds indicates that we are heading in the right direction, and the performance of the Target Date Folios suggests the ways that Target Date strategies can be improved. With three years of data, we cannot definitively state where the out-performance in the Folios is coming from and this is a topic of ongoing research. The research to date does suggest a number of conclusions, however. We have found that the Target Date Folios have risk levels that are consistent with the universe of funds. The out-performance is not simply due to higher allocations to bonds over this three-year period. The Target Date Folios are constructed out of ETFs and the resulting portfolios have expenses well below those of the average mutual fund. Finally, better diversification across and within broad asset classes has helped the performance. We have noted that many Target Date Funds’ returns are almost perfectly correlated to the returns of the S&P500. This is not unique to Target Date Funds. A portfolio that is 60% allocated to an S&P500 index fund and 40% allocated to bonds has a 99% correlation to the S&P500’s return. The Target Date Folios have notably lower correlations to the S&P500 than the corresponding Target Date mutual funds and this lower correlation, a direct result of broader diversification in the Folios. Our original research suggested that the higher level of diversification could leads to increases in annual return on the order of 1-2% per year. The out-performance of the Folios over the last three years is consistent with the improvements that we projected were possible from lower expenses and better diversification. It is important to understand that better diversification results from combining asset classes that tend not to move together, and not simply from buying things with different names. It is important to understand that better diversification results from combining asset classes that tend not to move together, and not simply from buying things with different names. While many investors think that they are diversified when they own U.S. stocks and international stocks, this may not be the case. Even back in 2006 (well before the crash), it was evident that domestic and foreign equities were very highly correlated. The stock markets of developed foreign economies moved hand-in-hand with the U.S. stock market. This was fine when markets were all rising together, but many investors were shocked when international and domestic stock markets declined together. Real diversification requires analysis. Most investors understand that stocks and bonds tend not to move in sync with one another. Commodities, REITs, and precious metals all tend to move somewhat distinctly from stocks and bonds. Inflation-indexed bonds (TIPS) also have unique performance properties. Those who are interested can see the asset allocations of the Target Date Folios at FolioInvesting.com. The choices and mix of assets are the result of quantitative analysis that requires projections for the risk and return of individual asset classes, as well as how these asset classes move relative to one another. *The benchmark is one of a series of Morningstar Indexes based on asset class projections and portfolio analysis models developed by Ibbotson. These indexes do not include any expenses associated with investing (explicit expenses such as management fees and implicit costs due to execution such as the bid-ask spread). The Morningstar indexes have three risk levels: Conservative, Moderate, and Aggressive.